Dr Rajesh Arora is the leading Urologist and Andrologist of the hospital. He has a vast experience of doing Endoscopic removal of stones of kidney, ureter and bladder making all the surgeries stitchless and scarless. It helps in quicker return of the patient to his daily routine and prevents the morbidity of an open surgery. Besides he is an expert at laser treatment of many urologic illnesses. He also has a keen interest in managing male infertility. 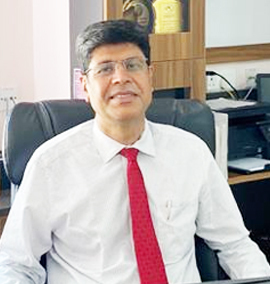 Dr Rajesh Arora, a leading urologist of the city of lucknow. He was awarded MS. Degree in year 1995 at K.G. Medical University and awarded M.Ch Urology at Jawahar Lal Institute of Postgraduate Medical Education & Research. Dr. Rajesh Arora MS (Surgery), Mch (Urology) has to his credit an experience of more than 10 years in urology and is abreast with all the latest advances in urology surgery. Dr. Rajesh Arora was earlier lecturer in the department of urology at Institute of Kidney Disease and Transplantation, Ahmedabad. He was Senior Consultant Urologist at Apollo hospital, Ludhiyana. 1. Aastha Maternity, Urology and Laparoscopy centre Ashiyana Lucknow. 2. Health city and trauma centre, gomti nagar lucknow. 3. Department of Urology at Vivekananda Hospital, Sahara Hospital. He is performing all types of Endoscopic (PCNL, URS, TURP, TUR Bladder Tumor, VIU, Endopylotomy etc.) and open urology difficult and highly specialized surgeries like VVF, Ureteric (Reimplantation Pyelopasty, urethroplasty, radical cystectomy, urinary diversion etc) along with surgeries for male infertility. He has a vast teaching experience during his post graduate & as a senior resident in a Department of surgery for three years at King Georges Medical University, Lucknow. Worked as senior resident in Department of urology JIPMER, Pondicherry. Worked as Lecturer (Department of Urology) for one year at Institute of Kidney Disease Ahmedabad. He is a very laborious surgeon always keeping in mind the difficulties of suffering patients and providing the necessary treatment and care to them so that their sufferings are alleviated. He is always at the fore-front in emergencies situation and work very calmly. Dr. Rajesh Arora, a man of great vision and it is solely due to which Aastha Hospital has become super speciality hospital in a very short period of time.